In children, bedwetting is not a new phrase as every child goes through this issue in the childhood. In general terms, Bedwetting is considered as involuntary urine release while sleeping and it is also called as nocturnal enuresis. However, mainly it troubles young children, but in some cases, this problem has found in adults as well. It is estimated that 2.4 percent aged people suffer from bedwetting. This issue of bedwetting is categorized in different types and here you will learn about various bedwetting types. The understanding of bedwetting types is necessary to learn if exact condition of your problem. Basically, it is of two types in which one is primary and other is secondary bedwetting. The Primary type is a common one and as per this condition, a child daily wets his or her bed for 6 months or more. The secondary type refers to condition in which the bedwetting starts in intervals of dry nights for 6 months. Both of these types are related to different reasons and one requires using different alternatives to deal with these two bedwetting types. A competent health provider knows the difference of both types of bedwetting. 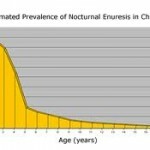 Excess urine production at night. This type of bedwetting starts after dry night intervals for 6 months. Secondary bedwetting is not a consistent problem but it starts and then stops and again starts. Some risks associated with primary bedwetting type are also related to secondary bedwetting type. In these risk factors, upper airway obstruction, constipation etc. are quite significant. Some risk factors are only related to secondary bedwetting types which include onset diabetes, urinary infections and stress. So, children or anyone who suffers from secondary bedwetting have to face disastrous issues due to this problem. To determine the accurate treatment, it is essential to have knowledge of bedwetting types. The medication for each type is different. For successful treatment, you should firstly diagnose the bedwetting type which is troubling you. Some children automatically overcome bedwetting without any specific treatment, yet some require medical attention. For such children, parents should know their duty and try reassuring children with favorable words. The help from parents and doctor can only work to get your children out of such sleep disorder.